Spent the 25th and part of the 26th up on the crick. Some of that time was spent on the little bench you see on the lower left corner of this picture, whittling hooks. I made some blanks that are yet to be finished, from cedar that grows aplenty near the crick. The water is at its high mark for the season. Later you'll see lots of rocks and the crick bottom, when the level settles into its less exuberant self. Even the crick is feeling its oats in the spring. 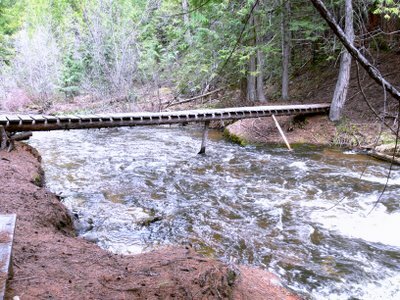 The bridge you see is a little foot bridge we built as one of the very first projects after getting the place back. It connects the north and south pieces of the acreage, which is otherwise separated by the crick. This spot is so peaceful. A great place to sit and get re-acquainted with the really important things that seem to get put aside in city life. I'll post pics of the hooks that resulted from this little retreat as soon as they're finished. If I close my eyes I can hear the water. Couldn't think of a prettier spot for creating. Lucky you. Can't wait to see the hooks. I love the line... "a great place to sit and get re-acquainted with the really important things that seem to get put aside in city life." I wish everyone had a spot like this. Actually the crick is pretty loud this time of year. 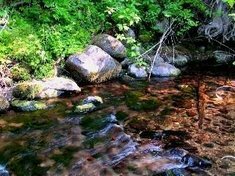 Pretty and nice to listen too, the rush of the water so anxious to get to the river..but my favorite time is when it's lost a bit of its exhuberence and has quieted to a more melodous tone. Wisht i could have all you guys up sometime. It's a pretty special place. Dude, can't you just picture a little cracker sitting on that bridge, swinging a banjo? But yeah, i think the same thing every time i go there. Amazing. I've been there every chance i've had since i can remember and it still amazes me. Yes i wish everyone could have a crick too. And i suppose lots of folks do, in one way or another. Yet, its the same amazed "yeah" that i get when incredible grain reveals itself as a hook is being formed. I wish everyone could have that experience. Thanks for seeing that, Pam. thank you for sharing. it really does make one think about what is important and what is not. what a wonderful place to create... no wonder your hooks are sooooo beautiful! I am still loving my first jimbo hook... still working on the necklace idea... can't quite make it come together as i thought... i will get it though! p.s. my hook is lonely... don't forget about me when you are creating! That looks like bliss, no wonder your hooks are so beautiful!